Today, I want to introduce you a full-time blogger that runs several websites, in different niches. Thanks to his experience in internet marketing, Gaurav is now dedicated to helping others earn an income online. He shares his experience on his main site, eAskme, where he writes about blogging, social media, SEO, affiliate marketing etc. Hi, Gaurav. Thank you for accepting my invitation! Please tell us, how do you introduce your profession to your friends and family? Thanks for inviting me on your blog, Minuca. I am a professional blogger and it is easy for bloggers and internet marketers to understand what I am doing. Unfortunately, in India, people are not much aware of blogging or what a blog is so it can be hard for bloggers to make their family and friends understand what they actually do. To make it easy for my friends and family, I tell them that I am a blogger and my profession includes research, writing, analyzing and internet marketing. There are times when people think that I am talking about some website designing and not about owning a website. I even need to explain the difference between a website and a blog. In the beginning, people think it as a waste of time, but when I show the result and money I earn, they believe it as a true profession. Actually, no one believes in your profession, until you show them the money you earn. How did you choose your niche? When it comes to blogging there are mostly two types of blogs. One is multiniche and the other is niche-specific. Deciding the niche of the blog is one of the most crucial tasks that mostly new bloggers ignore when they start blogging. I always believe in building a niche specific blog around the most profitable keywords in that niche. To find profitable keywords a blogger can do keyword research using Google keyword planner or SEMRush. For example, I wanted to start a micro niche blog regarding iOS Apps. I have found Cydia as a profitable micro-niche and collected the all profitable keywords. Purchased a domain with Cydia name and started a blog on the topic “Cydia”. It was all about jailbreaking or unlocking the iPhone and getting paid apps for free for your iPhone device. Because of the unique topic and a good reader base in the USA, I managed to earn more than $200 every month from Adsense only. I am a blogger of various niche. I manage many blogs but I am most popularly known as the Founder of eAskme. eAskme is a blog which has not only helped me to earn a lot but it also helped me to learn a lot. It is about making the life easy with money, work, and motivation. In what niches your sites are and how do you share your time and focus between them? Having multiple sites or blogs can be really tiring if you do not know how to manage them. I have various blogs but my focus always on my main blog, eAskme.com. Other than this, I have other blogs which are managed by few of my friends who are blogging to boost their knowledge and also to learn how to blog. Wikihealthblog.com is a blog dedicated to health related topics and it is managed by one of my friend Joey Fritz from South Africa and iOSCrunch.com is the another blog which is managed by Amandeep and Sona Mathews. Although lately Joey and Amandeep are busy with other things, still I am getting 1500+ traffic every day on these blogs. I have another blog which is Awardwinningblog.com. I am going to focus more on this blog also in coming days, and there will be lots of updates for the readers like eAskme.com. Every person tends to make mistakes and so does a blogger. We are not superhumans who cannot make any mistakes. We all learn from what mistakes we did in the past. I have done the same mistakes which most of the new bloggers do. The very first thing is that I started a blog with a free domain like blog.blogspot.com. Well, you can say that it was my luck that my mistake has put 3000+ USD in 6 months into my pocket. But after that, I faced the result of my mistake as my blog got a big hit. My second mistake was avoiding SEO and the lack of quality content. My grammar and English were so bad that I was making a hell lots of mistakes in my writings. With the time I have learned the importance of Domain, Web hosting, SEO and quality content. I also added the latest social media strategies into my quality book. It took time but now I know their importance and I am always ready to learn new things. Before starting a blog, you should make things clear in your mind. See what are your goals and how do you want to achieve them through your blog. I always say that research and analysis are just the first steps that we should take before making the next decision. If you are going to start a blog, first look for the niche which is not only profitable but also matches your interest. Because if you start a blog on something which you don’t like then sooner or later you will lose interest in it. Blogging is a passion, so choose the topic which you are passionate about. Now start looking for the profitability by doing keyword research for that topic. Write down all the keywords. Now book a domain related to the main or major keyword of your niche. Including keywords in domain name is really helpful to rank it effectively. Also get a premium hosting and use a user friendly design. I recommend WordPress platform and Genesis theme. Now you are ready to start creating posts. Remember, when you write a blog post, do not get carried away by your imagination, always stay focused on reality and talk about the main topic of your post. There are two things that can happen to a blogger like me who have more than 1200 articles on his blog, either you don’t have an idea what to write about next or blogger you have complete knowledge that you can dig deeper into your own niche and write more effective tips. I face both things, Mostly when I face the first situation where my mind get blank about what to write, I realize that this is the time to relax and take a holiday to freshen things up. It is always said that mind catches or create more ideas when you are fresh rather than when you are tired. In the second situation, it is easy to find topics as they come mostly after analyzing the most engaging posts or by the questions of your readers. I always analyze the user engagement on my posts and this helps me to find out on which topic my readers wants me to write more. I also get lots of questions and I gladly write to solve the issues of my readers. Search engine optimization includes both On-page and off-page optimization. When I focus on my blog post optimization I always keep my focus on: using keyword in the title tag, keywords in the description tag, use of heading tag, length of the content, avoid duplicate content, use canonical tag, update old content, Outbound links, Interlinking pages etc. It is always recommended to use keywords in the title, heading and description. Also, use keywords in at least first and last paragraph also but never overdo it. I always prefer to keep keyword density between 2-4 keywords per hundred words. Using LSI keywords also helpful to rank higher. Other than on page optimization I also focus on various off-page factors such as The number of linking domains, number of linking pages, link relevancy, authority of linking domain, links from homepage, the number of do follow vs. no follow links, diversity of link types, contextual links. Remember that linking should be natural and all links should be relevant to the content. From the blogging platform to the promotion and marketing, there are so many tools which are available for bloggers. What I am sharing here are few of the tools which are widely used and recommended by bloggers, and I also use them. It is one of the widely used and recommended platform for bloggers and webmasters. It is really easy to create and manage a blog on WordPress. There are unmatched benefits of creating a self-hosted blog on WordPress and it Gives you total control of your blog. Buzzsumo is a content idea generation tool. You can easily search the most popular content by just searching for the topic in its search bar. It shows the result with most popular ideas. You can write on the ideas that you find most popular and it will help you to gain good traffic. EMV helps you to analyze the emotional marketing value for the title you want to use. This helps you to decide which title is best for you and which can attract more visitors. Grammarly is a tool which helps you to fix grammatical mistakes in your content and make you content to stand as quality content. I always say that you should have email marketing tools from the day one on your blog. You can use Aweber or Feedburner. Social sharing tools helps you to add sharing buttons on your blog and it allows your readers to easily share the content they like on their own social networks. This is a good way to generate more traffic. Q. How do you monetize your site(s)&#039; traffic? Do you use Adsense, affiliate marketing, coaching, eBooks, consultancy, or other services to generate income? When it comes to making money blogging, there are endless opportunities for a blogger to make money online. Adsense is the first love in the life of a blogger. I use Adsense and Media.net ad network to monetize my blog with contextual ads. Other than these I use affiliate marketing also to promote products and services that I see are helpful for my readers, It helps me both ways by gaining traffic and making good money with affiliate commission. I have also created my own services for those who want my help and can pay me. My blog consultant service is actually bringing me good money every month and it’s also helping me to create a group of bloggers who follow me. I not only teach blogging online but also offer SEO services with the help of my SEO team. So, you see that there are various ways that help me to make few thousand dollars every month from all of my blogs. Thank you, Gaurav, for taking the time to participate in this interview! This was an awesome interview! I hope you learnt as much as I did from our guest. Please, share this post with your friends! Add your email address above so we can stay in touch. Thank you! Thank you for featuring me here! It is really good to be on an authority blog like MinucaElena. Thanks for replying to my interview, Gaurav! There is no doubt that Gaurav Kumar is a great blogger and motivational speaker. I really like to learn a lot from his blogs such as eAskme. I not only read about money making but also about how to make life more easy and happening in every way. It is good to see him featured on your blog. Earning a living online requires more than internet marketing strategies. It’s about discipline and the support of a mentor that pushes you to overcome any obstacles. I am glad you are learning so much from Gaurav. I know Gaurav Kumar not only as the founder of eAskme but also as a good personality. He is helping and kind person who loves to solve the issues of every single person. I have asked many questions on his blog via the contact form and he has always provided me the best solutions. I also appreciate your time that you have put into to get him featured on your blog. Gaurav is a very nice guy. He gave me some great suggestions on how to improve my site. He does a very good job on eAskme. Didn’t know that much about him though we have been connected with each other for years. This is called the benefit of publishing an interview. I like the way you coined each question and each one seemed to be serving the specific info needs of your blog readers. The best way of interviewing is not to make the interviewee says what he wants to say but to make him say what your readers want to listen. Thanks for sharing such a wonderful interview. I am so glad to see you here on my site. The secret of a great answer is a good question. 😉 I will come up with new questions next time. Although it feels normal in an interview to find out how a person started blogging I think the most interesting parts are the technical one list the on page SEO or the free tools. It is so great to learn about Gaurav Kumar. I see he is a popular blogger and I also have seen his writing at various sites. I appreciate that you have published him here also. I like to learn a lot from you both. I am grateful to Gaurav for sharing his experience with us. Managing multiple sites at the same time is a difficult job but he does it successfully. 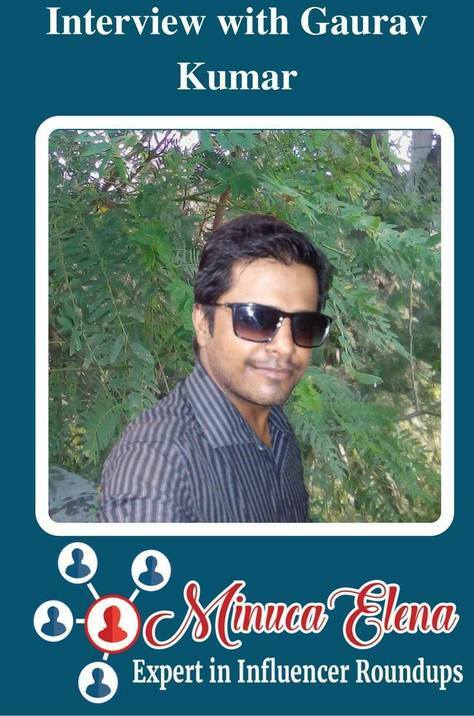 I am a regular reader of eAskme.com and I have seen how Gaurav has made it grow and popular on social media. It is really nice that you have featured him here. Thank for sharing this interview. It is really inspirational. I must say, this guy has inspired me alot. I have read a lot about him from my friends also and seeing him on your blog shows that he has good authority and name in his industry. Thanks Elena for sharing his interview. It is really great to know about Gaurav Kumar, he is not just a blogger but indeed a real great man. I have been learning blogging online from him and he helped me to understand many things which I was not aware about. I am great fan of Gaurav Kumar and eAskme. he is indeed a great blogger and really inspirational personality. I have learned a lot from him and his blog eAskme. I really appreciate that you have shared his story. Interviews help us to learn how professional are running online businesses successfully. It is real good to know more about Gaurav Kumar here. I am great fan of his work and he is a real help whenever I asked him any question. It is so great to see that professional bloggers are getting more exposure through these interviews. It is also good to learn about how they are making money online and motivating others to do it. Thank you for sharing really motivational interview of Gaurav Kumar. It is so good to learn about Gaurav Kumar. I have been following his blogs and know that he is managing many blogs. He has also helped me fixing banner error on WordPress, SO I know he is a really helping person. It is so good to see that he is featured here. I have just started learning blogging from last few days and found that the Gaurav kumar is a really influential blogger. I was searching more about him and found this interview. thanks you for sharing. It is so good to learn from his journey as a professional blogger. I am new to blogging and learning how blogs are working. Journey of professional blogger is always inspiring and motivating me to work as a professional blogger. Thanks for sharing this motivational interview. Professional bloggers always motivate others to do blogging and their life journey is always good to know what challenges are there and how to face them. I am learning from this interview that how Gaurav has started his blogging career. He is really a great blogger.